Here at Middleton Aggregates we pride ourselves on providing a fast and efficient service to customers over a vast majority of East Anglia, including Norfolk, Suffolk, South Lincolnshire, Cambridgeshire and North Essex. With our fleet of tippers, lowloaders, hiab and plant hire equipment we provide an array of services for the construction industry, ranging from the delivery of aggregates, to waste removal from sites, to plant delivery and hire. We also have collection points at some of our sites for customers to collect small loads (please see our Outlets page for more info). This site contains information on many of the products and services that we provide, however if you have a query regarding a product or service that you can't find on this site, please don't hesitate to call us and we will do our best to fit your needs. Our customer services team can be contacted on (01553) 841044. Check out our Gallery page to see photo's of our newest trucks. We have three new lorries that joined our fleet this year, a 4 wheeled tipper, articulated tipper and an 8 wheeled tipper. We have some fantastic photo's thanks to a DAF photographer taking a photo shoot of the new vehicles which hopefully will be seen in the DAF magazine in the near future. Clicking on the photos will load up larger versions. Middleton Aggregates was first established in the late 1970's under the trading name of J W Lemon and operated as a haulage contractor from Middleton Service Station in Norfolk. 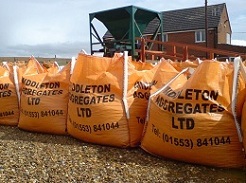 The company's activities subsequently expanded to include quarry operation and the retailing of minerals throughout Norfolk, South Lincolnshire and Cambridgeshire. 1986 saw the formation of Middleton Aggregates Ltd as growth continued. Despite generally difficult trading conditions in the industry in the early 1990's the company continued to trade successfully, due in part to the winning of large local contracts. In 1996 the company acquired A R Tilbrook Ltd, based near Bury St Edmunds. This increased the company's involvement in mineral recycling and plant hire operations. The latter activity was further augmented by the purchase in 1998 of G A Slingsby & Sons. 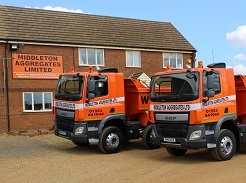 These acquisitions, together with the continued growth and development of the company, has resulted in Middleton Aggregates Ltd becoming one of the leading suppliers of aggregates, fill materials and plant hire to the construction industry in East Anglia. In conjunction with our policy of continuous improvement, it is hoped that we can continue to achieve steady and sustainable growth, to the benefit of our employees, our shareholders and our customers.